Maybe it’s just me, but for a long while, I was leery of the unknown entity known as the “prepper.” You probably know the old joke format: I’m a homesteader (sensible, thrifty); you’re a survivalist (fleeing to the country for personal safety); he’s a prepper (building an underground bunker, stockpiling seeds and weapons). …I first heard the word “prepper” when someone asked me if I was one. He was an absentee landlord doing some yard maintenance on his property next to ours about two years ago. Pleasant chap. I was impressed that his whole family pitched in, from the two-year-old up. He and the family took on the job of dismantling an old shed in our yard for a small fee, and they did exactly as they promised, leaving no trace behind. I had to confess I had never heard the word. Mind you, Donnie and I are not big TV watchers and our main interests—canning, bluegrass, biking and road trips—are not exactly on the cutting edge of anything. But I was writing a book about homesteading and I knew instantly that “prepping” was something I ought to find out more about. Our neighbor hung out for another few days cutting trees and dragging away branches, during which time, we had our oil tank moved to expedite the removal of the shed. The neighbor was at pains to tell me, in guarded tones, that I needed to have a special security lock installed on the tank in case “they” tried to steal the oil when “it” happened. He was never very specific but it didn’t take rocket science to figure out that the one who posed the question about prepping was probably a prepper. So I asked him, shyly but slyly, if he knew any preppers I could interview for my upcoming book. He suddenly became evasive, telling me about someone he knew who “might be” a prepper but probably wouldn’t be willing to talk to me about it. After that, it seemed as though he didn’t come around as much and our brief friendship waned. But by then I was on it, researching the prepper M.O. A pretty thorough Internet search revealed many prepper websites and communities. But they were not very accessible. In fact, the prepper organization in my home state had such a complicated process for joining up that I was not able to successfully contact anyone except a kindly webmaster who promised to vouch for me if I ever did get past all the passwords and into the system. But I never did. By that time (mid-2012) the Doomsday Preppers reality series on the National Geographic Channel had been airing for a few months. I tuned in to a show about a couple living in a semi-truck, constantly rolling. It was pretty clear that this couple were ipso facto not “homesteaders;” in fact, if they were representative of preppers, always on the move, then it was less likely than I thought that prepping intersected with homesteading, despite both having some common roots in the “survivalist” movement. 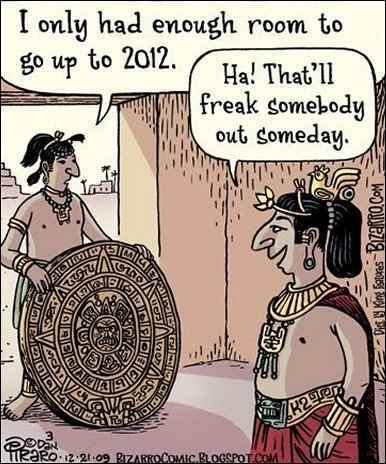 A vague picture was beginning to form in my mind of what prepping might consist of as we were barreled along full speed ahead to 12-21-2012, the date when some people were sure the world would be ending, based on “evidence” from the Mayan Calendar. 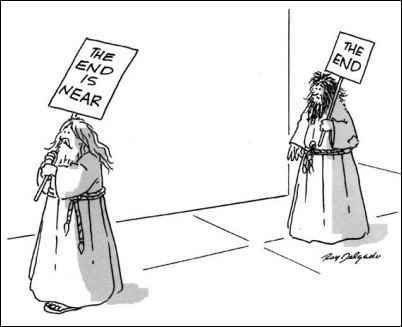 They were wrong, as it turns out. I was wrong, as it turns out. With the exception of my mysterious neighbor, I had yet to meet up with a genuine, card-carrying, dyed-in-the-wool, self-acknowledged prepper, even online. But I continued to brood about who and what a prepper might be. As my speculation increased, the prepping ethos was slowly morphing into something a lot more accessible, even a tad more mainstream. Still, the stereotypes kept getting in my way…until I read a real prepper book by a dedicated prepper, and began to see where and how my aspirations could and did intersect with those of preppers…..
As a book reviewer, I was lucky to get a copy of Jim Cobb’s The Prepper’s Book of Disaster Readiness (all of Cobb’s books are published by Ulysses Press). 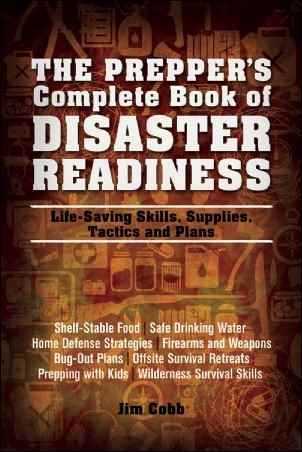 It was in reading and reviewing this useful manual that preppers gradually came into focus for me. The more I thought about them, the more like us they seemed. Didn’t we have 68 jars of local-orchard apples, and 35 jars of homegrown tomatoes (read my Homestead article, “Rotten Tomatoes”, for the reasons why we had so few quarts of tomatoes this year) and, especially for Donnie, about 40 jars of Virginia peaches, all neatly lined up in the larder? And hadn’t I put a first aid kit and an ice scraper in both our cars, and filled a bottom drawer full of warm, fuzzy work clothes and heavy socks, just in case? Just in case what? 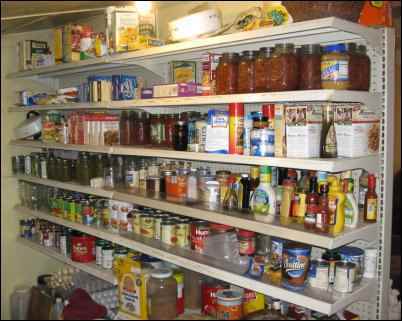 Was I—shudder—thinking like a prepper? In TPBODR, Jim says that his own first lesson in preparedness came when his wife had her first baby: what he did and did not take to the hospital for that event prompted him to develop what he calls a Get-Home Bag. In the GHB, you should carry a water, food, fire, and shelter. Really, these are the basics of survival anywhere and anytime, and having them, or the wherewithal for them, in your car in a portable sack is a great idea. What’s in your GHB? I have a bicycle in my car. I like to think that trumps a lot of smaller items as useful equipment in emergencies. He was obviously a fearless kid, because instead of burying his head in the metaphorical sand, he met the end-times head on. 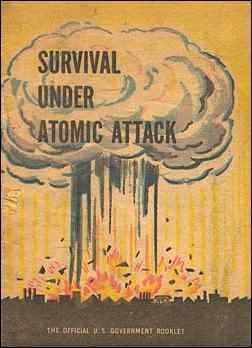 “When I was about 12 years old, I purchased a copy of Dr. Bruce D. Clayton’s book, Life After Doomsday. I read it cover to cover, several times. Around the same time, I read Jerry Ahern’s series, I” Pretty dark stuff for a kid, and Jim admits that, “At that point, my fate was sealed, in a sense, to be a prepper/survivalist.” Jim works as a private investigator and recently has become a writer—of prepping books. Prepping, by the way, is not the same as hoarding, although there may be a point of cross-over. The older generation that came up during the Great Depression developed a hoarding mentality, as do many poor people with a lick of sense. Who knows when you might need those jars? Those apple crates? That spare tarp? Grandmother’s cast-iron skillet? Of course, hoarding can develop into as, Cobb describes it, “an overriding compulsion to collect and keep items that have little to no value, whether monetary or otherwise,” whereas the prepper is concerned with “the collection and stockpiling of food and supplies that, even if a disaster were to NEVER happen, can and will still be used.” Some people might not see the distinction as clearly as Jim Cobb, but I take the point that preppers have an avowed purpose in stockpiling useful material (like squirrels do), while hoarders just want to keep stuff for the comfort of having stuff (like pack rats). The author builds several scenarios that might make any of us think—hard—about how prepared we are for disaster. Let’s look at some in detail. Flu outbreak. Between 1918-1920, hundreds of thousands of healthy young Americans and others around the world died of what was called Spanish Influenza. The flu’s second wave, in which the virus mutated, was as devastating as the first. More people died of Spanish influenza in its nine-month peak than died of the notorious Black Death in Europe in four years. Although we like to think (note “like to think” as opposed to “actively feel convinced”) that modern science has eliminated, or can eliminate, any new flu virus, consider the strange outbreaks of other diseases that pass across the headlines: meningitis, pneumonia, diseases that suddenly crop up with no apparent cause. Because we live in more crowded quarters than we did in, say, 1918, the spread of infection is more likely, and yes, it can infiltrate the country folk, too, despite our best control efforts. The spread of disease causes panic, panic causes unrest, and unrest causes certain behaviors that might make us want to reconsider our PREParations. Power outages are another increasingly problematic scenario, often following natural disasters like flooding and freezing. Are you ready for a protracted outage? And—thinking like a prepper here—if you have a generator, is it protected from possible looting?…..
…Because civil unrest is another scenario that preppers brood about. Civil unrest can be the ugly stepchild of any disaster, especially if the disaster and its effects cause lengthy dysfunctions of the systems that usually tie us together. If we don’t believe that civil unrest is possible, we have only to look at the aggressive behaviors spawned by something as apparently benign as pre-Christmas shopping! Cobb recommends a 3-D strategy: Deter, Delay, Defend. Deter: Make your home, your personal and family living space, however you define it, look too secure for a looter to bother with. We lived in Mayberry for a few years, so charmed by the friendly, moral base of the community that we never bothered locking stuff up. Then we had a break-in. “Surprise, surprise!” as Goober might say. Now we have motion sensor lighting and a coded lock. That’s Deterrence. Delay: Warning systems, like the motion sensor lighting, can produce the Delay, giving you time to assess and, if necessary, move to the next level…..
Defense: this is what happens when the first two systems break down. Plenty of homesteaders have weapons, and many are prepared to use them against menacing humans as well as annoying, tasty deer. No one can advise you about this, but we all need to consider it seriously. Cobb, and we all, know that prepping is not a simple concept, any more than it is a simple practice. One thread leads to another. One thing he is clear about, though, is that prepping is not a selfish effort: “I don’t think trying to work towards keeping your family and loved ones alive is selfish at all, quite the opposite, in fact.” And, “If more people actively prepped for emergencies, it would certainly allow first responders and other aid agencies to concentrate on helping those who truly need assistance in times of trouble.” Sounds sensible. Q1: Why do you want to survive (not just how)? A1: To put it simply, survival beats the alternative by a long shot. Q2: How do you choose who survives with you? A2: I take my responsibilities as a husband and father quite seriously. I feel it is my job, my duty, to protect them and keep them as safe as I can. While I have no guaranteed way to decide WHO survives with me (assuming I’m among the survivors to begin with), I feel it is the responsibility of every parent to do whatever is within their power to ensure the safety of their children. By a long way around, it seemed I had bridged, to my satisfaction, the divide between homesteading and prepping, and found it to be less like a narrow rope-bridge over a bottomless chasm, and more like a rainbow bridge, filled with many shadings of color, some mysterious murky depths, and a few twinkling stars. The debate between the pepper way and the homesteader way may go on forever, but as for me, I’m going to STOP (another of Jim Cobb’s acronyms): Sit down, Think, Observe, and Plan.